DAVIS, CA--(Marketwire - September 25, 2007) - Freedom from Hunger, an international nonprofit development organization, invites local citizens to join a revolutionary approach to ending world hunger. Freedom from Hunger Day is September 28. 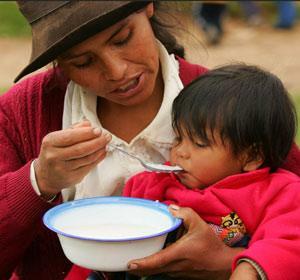 Everyone with online access is invited to log on to connect with self-help heroes ending hunger in Latin America, Asia and Africa. On September 28, Freedom from Hunger will host a day-long virtual event on its website: www.freedomfromhunger.org. Participants can take part in real-time chats with staff in Africa and India; download sound bites of women sharing dreams; exchange international recipes contributed by gourmet chefs; see the premiere of two inspiring and beautiful videos, and participate in a live discussion about trends in microfinance with Freedom from Hunger's President, Dr. Chris Dunford. By capitalizing on the Web 2.0 revolution, Freedom from Hunger uses an innovative community-based approach to bring people together to combat the global problem of chronic hunger. "I was originally skeptical of technology's ability to bring people together," admits Freedom from Hunger Day creator and Senior Communications Manager, Amber Stott. "But when I started using the tools, I realized that technology could be a powerful and easy way to involve people in the solution to world hunger. And it is about people -- connecting us across geographical divides that truly disappear when we join in a common cause. This connection is the critical element that I believe Freedom from Hunger Day successfully captures by moving online." Freedom from Hunger's website also offers opportunities to take action immediately, such as sending free awareness e-cards and declaring personal plans to end hunger locally or internationally. Freedom from Hunger Day is being sponsored by Worldways Social Marketing and Capital Public Radio. For further information about Freedom from Hunger Day, contact Amber K. Stott at astott@freedomfromhunger.org or 530/758-6200. Freedom from Hunger Day will take place online at www.freedomfromhunger.org. Founded in 1946 and based in Davis, Calif., Freedom from Hunger is the largest California-based organization dedicated to using microfinance as a sustainable way to end hunger around the world. The nonprofit is helping more than 680,200 families in 17 countries, providing resources to approximately 3.5 million people around the world to achieve lasting food security.